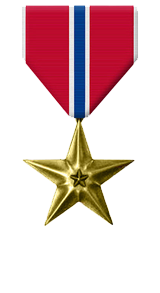 For meritorious achievement in connection with combat operations as the Battalion Executive Officer for 3d Battalion, 3d Marines, Combined Joint Task Force-76 from August 2004 to June 2005 in support of OPERATION ENDURING FREEDOM. During this period, Major Beckett performed his duties in an exemplary and highly professional manner. 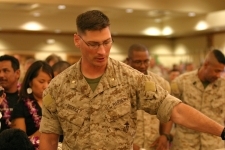 As the Battalion Executive officer, he coordinated and executed critical staff actions in support of pre-deployment activities as well as for contingency operations while deployed. He expertly led the Battalion’s Pre-deployment Site Survey as well as the Advanced Echelons both into the combat theater and back to home station. 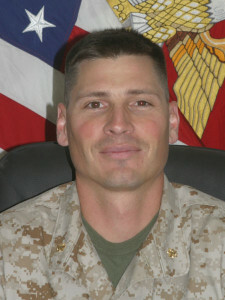 During both the Pre-deployment Training Program and during ongoing combat operations while deployed, Major Beckett expertly directed the Bravo Command Group and facilitated split Battalion operations over a distributed battle space. This significantly contributed to the Battalion’s success while conducting over 2,600 combat and security patrols that included nearly 60 engagements with enemy forces. As the Battalion’s chief of staff, his experience and diverse knowledge of every functional area within the Battalion staff significantly enhancing staff integration and efficiency. 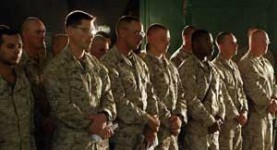 While inspiring Marines, sailors and attached soldiers, he earned the utmost respect and cooperation of contemporaries, subordinates, and seniors alike. Major Beckett’s professional ability, steadfast initiative, and selfless dedication to duty reflected great credit upon himself and upheld the highest traditions of the Marine Corps and the United States Naval Service.